As the South’s first reinforced-concrete frame high-rise office building, the Bisbee Building has more kinship to the Chicago style than the Prairie School. 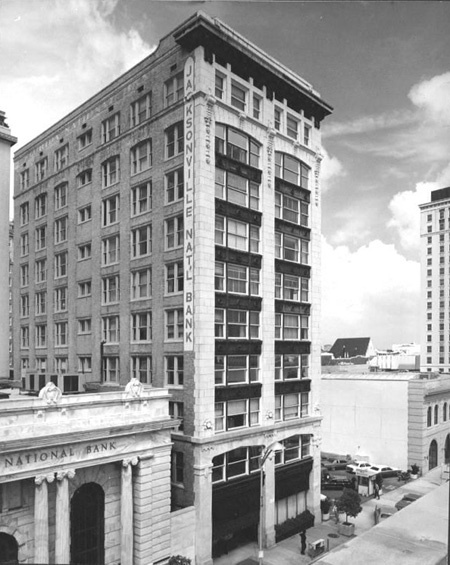 However, this building was of central importance in introducing the modern architecture of the Midwest to Jacksonville, which resulted in the city’s becoming the Southern epicenter of the Prairie School. 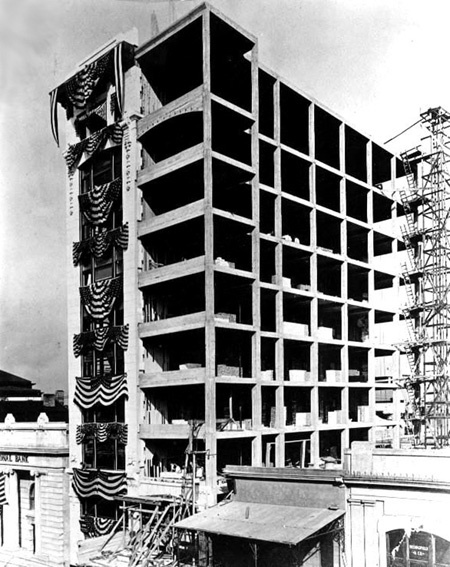 This building was originally constructed to be only twenty-six feet wide (one-half of its present width) as a narrow skyscraper ten stories high, emphasizing its height. 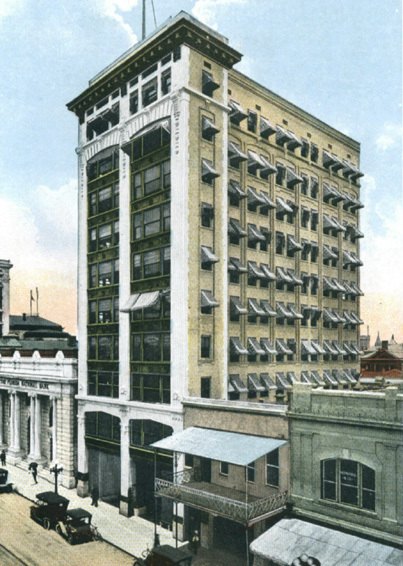 The novelty of its being Jacksonville’s first “skyscraper” made the office space highly sought after, and the building was completely rented before construction was finished. Thus the owner, William A. Bisbee, directed the architect H. J. Klutho to double the size of the building. The east wall of the original narrow tower was removed and an additional vertical section was added, resulting in its present configuration. 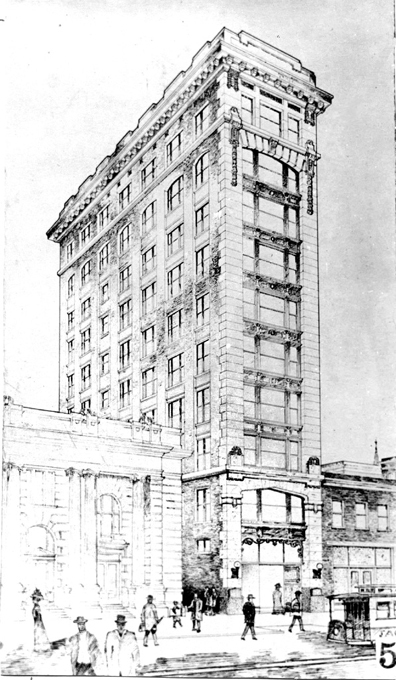 The Bisbee Building’s ten-story reinforced-concrete frame was structurally daring for 1908. 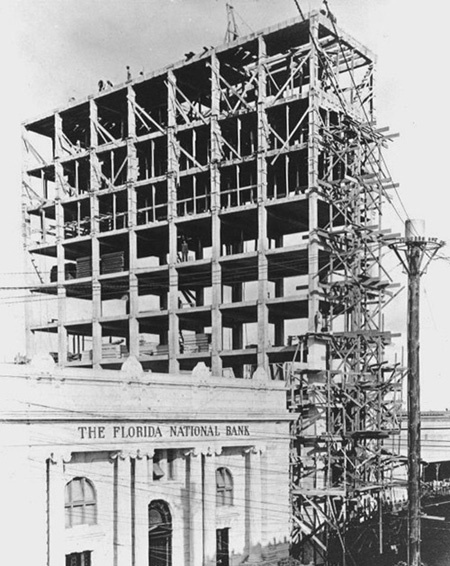 According to Klutho, this system was so new that the Metropolitan Life Insurance Company refused to make a construction loan until full engineering data were submitted, and their own architect was dispatched to Jacksonville to go over the figures. asked Klutho to double the size of the building. 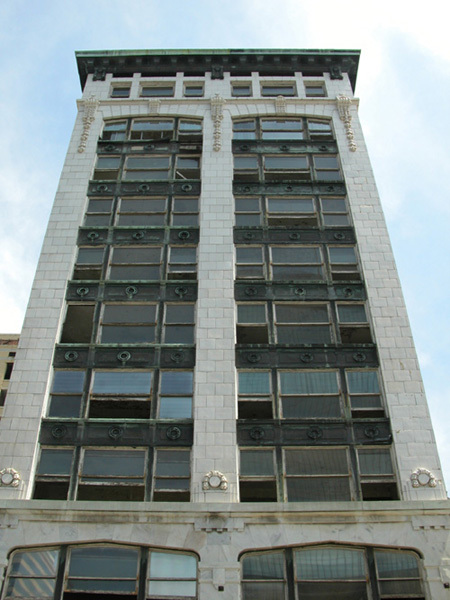 The Forsyth Street facade is faced with polished limestone and terra-cotta, and features broad plate glass “Chicago-style” windows, a projecting copper cornice, and various abstract geometric ornaments. This building is an early example of Klutho’s affinity for the architectural concepts that were pioneered in Chicago. 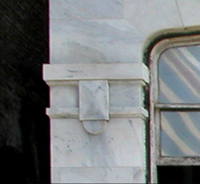 The ornamentation on the Bisbee’s facade is neither Classical nor quite yet Prairie School, but there are tentative overtures to Sullivan’s foliate designs in the three glazed terra cotta pier capitals at the ninth-floor level (left) and to Wright’s Larkin Building in the cross motif at the second-story level (above). Nearly every Prairie style building constructed in Jacksonville over the next 15 years had some variation of this “Prairie School cross” motif. Archival photos courtesy of Robert C. Broward and Wayne Wood. Color photo by Wayne W. Wood, and black and white by Judy Davis. • Wood, Wayne W.: Jacksonville's Architectural Heritage: Landmarks for the Future. Gainesville, Florida: University Press of Florida, 1996, p. 60.